SMS marketing should always be permission-based. If you blast out random messages to people who never opted-in, you’ll not only tick them off, but you’ll probably violate an SMS regulation or two. To avoid that headache, ask customers when they first sign-up what kind of information they wish to receive through SMS. Additionally, let subscribers know how many messages a month they can expect and follow-through. On the flip-side, provide an option to opt-out of your SMS messages. You’ll establish trust and credibility with your subscribers by including, “Text STOP to unsubscribe,” in your messages to them. If you want your SMS marketing to work, offer people tantalizing incentives in exchange for their cell number. Offer special coupons, exclusive deals, or insider access to people when they opt-in. Not only will this make them feel like they’re part of an exclusive community, but it’ll ensure a higher rate of engagement on your future SMS communications. If you send out a marketing text—whether it’s for an upcoming webinar or a new product release—be sure to create a sense of urgency and attach a timeline to it. Don’t merely invite people to download your new piece of content. Instead, give them 24 hours to access it at a discount (or for free). By attaching a simple expiration on your promotional SMS messages, you’ll motivate people to take action right away rather than letting your text message slip immediately off their radar. Rather than sending SMS messages from a full phone number, set yourself up with a vanity short code. 44-3625 is a whole lot easier to deal with than +1(573)273-8643. Pick a short logical keyword. For example, PICKLE (74-2553) would be a great one for a deli or a food truck. Most of the good ones will already be taken, but if you exercise your noodle just a little bit, you’ll be able to pick a vanity code ideally suited to your campaign. If you need to create your own short code check out the U.S. Short Code Directory. Not only can you see what companies are using which short codes but you can also find out how each short code is being used and find inspiration to what to use as yours. The short code directory doesn’t only provide information on who is using which short codes, because when it comes time to purchase your own short code, you can receive help for that through the site as well. TENNESSEE Referral Listing Agents for Bank Asset Drop – MARCH 2017 – (3 Licensed Agents Wanted) FAST REGISTER: agentpages.leadsystems.co. Hey, Kenny. We’ve got some inside information on a load of Bank Assets that are about to hit the market in your area. We need 3 licensed agents to help us list these properties. Check out agentpages.leadsystems.co if you’re interested. I would’ve been far more likely to consider (or at least read!) the second one. 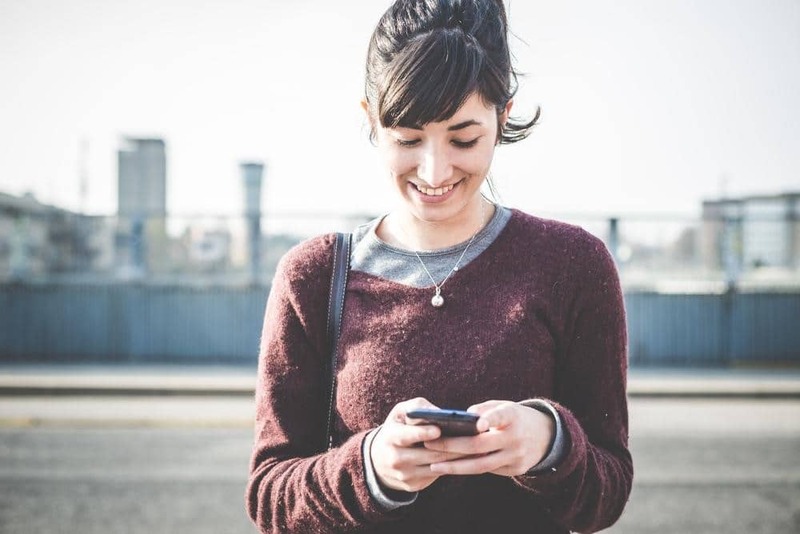 Don’t make the same mistake; personalize your SMS messages if you want success. You can get away with sending several emails to a subscriber once a week or even in a day. The same doesn’t apply to SMS marketing. In fact, four or five messages can be considered excessive. So tracking and measuring the success and impact of your SMS campaign is critical. In 2016, advertisers spent an estimated $100 billion to reach people via mobile. Amazingly, the clear majority of that money was aimed towards mobile ads on websites and apps. With a few SMS best practices under your belt, now’s the time to go after this hugely untapped goldmine! Though SMS marketing has helped a lot of organizations in their mobile advertisements. But an over efficient use of any marketing technique may result negative. 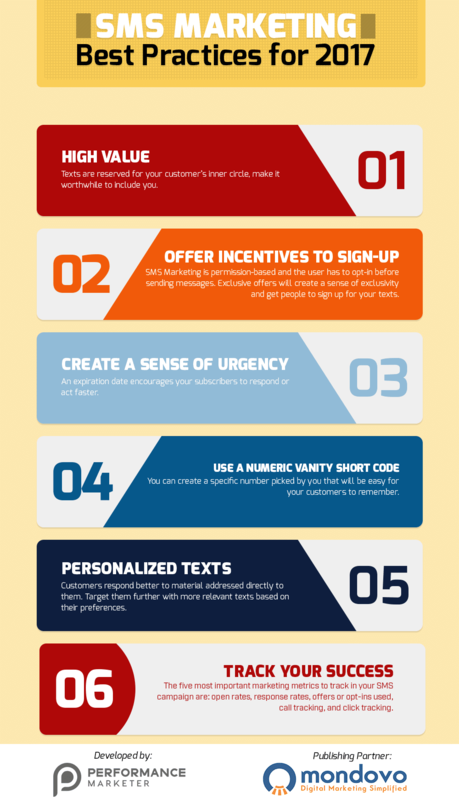 Below are some tips for getting the most out of your SMS marketing campaign. Understand Timeliness. Frequency is Key. SMS Marketing is the excellent promoting and advertising service to engage the customers towards the business. I appreciated with your best practices points of SMS marketing. In addition to instant replay to the customers which makes more interesting advertisement. Sms marketing will be much more beneficial for the small business. SMS marketing is one of the best ways to promote your products and as it has way more open rates as compared to emails, so one really get a lot of targeted customer from SMS marketing. These are very useful practices for sms marketing in 2017 and surely help run a successful sms marketing campaign. I will surely implement these practices on my next sms campaign. SMS is a great channel but in order to produce good results you need the right incentive, that’s why i believe text to win sweepstakes combine the best of both worlds…the SMS channel with a good-ol fashion “win a prize” incentive.